InM organised a Special Seminar on “Managing Forests and Trees for Climate Change Mitigation and Adaptation” held on June 08, 2015, Monday at 11:00 A.M. at PKSF Bhaban, Agargaon, Dhaka-1207. Dr. Henry Scheyvens, Director, National Resources Management Group, Institute for Global Environmental Strategies (IGES), Japan, delivered the keynote speech . Md. Abdul Karim, Managing Director, PKSF approached to Climate Change Adaptation. 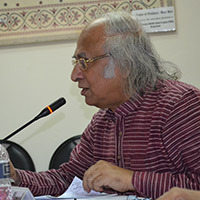 Dr. Qazi Kholiquzzaman Ahmad, Chairman, InMInM), presided over the seminar. Professor Khalily welcomed all in the seminar and thanked every one. He mentioned that InM has a joint Project with IGES. The main purpose of the project is to understand the climate change issues, adaptations, mitigations and coping ability of the households. Institute is no longer mimiting its research to find out the impact of microfinance rather its focusing on poverty alleviation, climate change issues, mitigation, adaptation, inclusive finance and growth, migration and so on. The poverty research of InMis not only focusing on income income indicators rather focusing on the multidimensional povertty aspects. In the comcluding lones he once agaion thanked and welcomed all the participants on behalf of the institute and handed over the session to the chair . 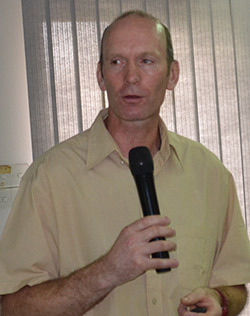 Dr. Henry Scheyvens said, Developing countries receive payments for verified reduction of GHG emissions from forests and sequestration of carbon by forests. UNFCCC encourages the following mitigation actions in the forest sector:a. reducing emissions from deforestation and degradation in developing countries (REDD) and b. conservation, sustainable management of forests and enhancement of forest carbon stocks in developing countries. Based on the fact the research includes development proposal, test, implement and disseminate approaches to engage local communities in monitoring their forests, including changes in carbon stocks. It also brings together the REDD+ safeguards & carbon stock assessment by engaging local communities in assessing & monitoring carbon stocks in their forest. He also mentioned that coping with shocks and disaster risk management can help in meeting rural people’s emergency and contingency needs as the expenses involved in social functions (e.g. wedding, funerals, and religious festivals), natural and other human induced disasters, responding to extreme impact of climate variability, and physical and economic incapacity. He told that household consumption of fruits like jack fruit, mango, banana, guava, coconut, papaya, etc. from the homestead trees and the cash earned through the sale of fruits and other tree products help during lean periods. In villages of high elevation and hilly regions, root crops and tubers produced under trees are extensively used during lean periods. 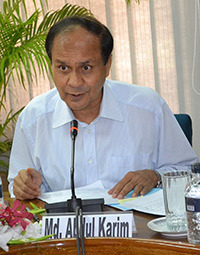 Dr. Rezaul Karim, Climate Change Negotiator, thanked InM and IGES for arranging such a time demanding seminar. 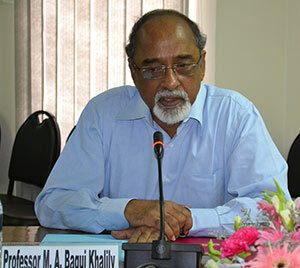 In his opinion numbers of many projects are implemented in Bangladesh regarding climate change issues. In his opinion one thing need to be considered that adaptation methods needed to be action oriented so that people are directly benefitted by these. Before implementing any project this things needed to be ensured. Abdul Karim, Managing Director, PKSF said managing trees is an important issue for country like Bangladesh where people are heavily dependent on nature. Developed countries provide us grant but that is not sufficient. In his opinion we should have concrete project for afforestation. Appropriate steps are needed to be taken before its too late as we have limited forests left. This situation need to be improved, more trees need to be planted to mitigate the upcoming disasters. In his opinion all the steps are needed to be taken in a sustainable manner involving the community people. Dr. Qazi Kholiquzzaman Ahmad, Chairman, InM, mentioned it is important to mention that if the forests are degraded the natire will loose the balance.appropriate forestation program is the only option here. Reducing green house gas emissions and crabon trade is a mutual understanding the forest density is only 10 to 15 percent, where as it should be 20 percent. Different effective measure are needed to be taken in this regard. For adaptation in the coastal areas planning eco friendly and climate tolerance trees in the coastal belt may be a sustainable option. In his opinion river erosion can be stopped in this way. In his opinion we should be more careful in this regard whether we receive find or not because a healthy and better environment is not a requirements it’s a right. If negotiation is required that is needed to be done critically. Climate change should not be ignored and if necessary steps can not be taken on time nature will take the revenge in its own way.